The clinician turns on the catheter’s UV light, which activates the adhesive glue on the patch, connecting it to the heart wall. Researchers from Boston Children’s Hospital, the Wyss Institute for Biologically Inspired Engineering at Harvard University, Harvard John A. Paulson School of Engineering and Applied Sciences (SEAS) and the Karp Lab at Brigham and Women’s Hospital have jointly designed a specialized catheter for fixing holes in the heart using a biodegradable adhesive and patch. As the team reports in Science Translational Medicine, the catheter has been used successfully in animal studies to facilitate hole closure without the need for open heart surgery. "This really is a completely new platform for closing wounds or holes anywhere in the body," says Conor Walsh, Ph.D., Wyss Institute Core Faculty member, Assistant Professor of Mechanical and Biomedical Engineering at SEAS, founder of the Harvard Biodesign Lab at SEAS, and author on the paper. 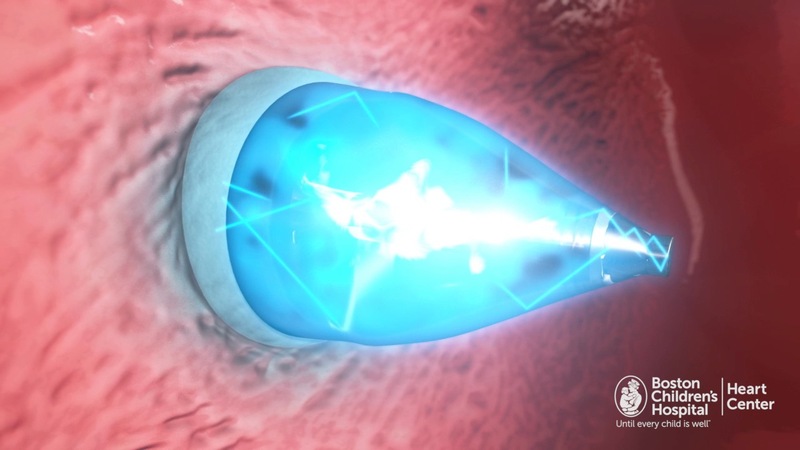 "The device is a minimally invasive way to deliver a patch and then activate it using UV light, all within a matter of five minutes and in an atraumatic way that doesn't require a separate incision." SEAS/Wyss Institute’s Ellen Roche, Ph.D., co-first author on the paper along with Boston Children’s Assunta Fabozzo, M.D., adds that the device is designed to be customizable. For instance, the rate at which the patch biodegrades can be slowed or accelerated depending on how quickly the surrounding tissue grows over it. Further studies will reveal the appropriate lengths of time for different circumstances. The Wyss Institute for Biologically Inspired Engineering at Harvard University uses Nature's design principles to develop bioinspired materials and devices that will transform medicine and create a more sustainable world. Wyss researchers are developing innovative new engineering solutions for healthcare, energy, architecture, robotics, and manufacturing that are translated into commercial products and therapies through collaborations with clinical investigators, corporate alliances, and formation of new start–ups. The Wyss Institute creates transformative technological breakthroughs by engaging in high risk research, and crosses disciplinary and institutional barriers, working as an alliance that includes Harvard's Schools of Medicine, Engineering, Arts & Sciences and Design, and in partnership with Beth Israel Deaconess Medical Center, Brigham and Women's Hospital, Boston Children's Hospital, Dana–Farber Cancer Institute, Massachusetts General Hospital, the University of Massachusetts Medical School, Spaulding Rehabilitation Hospital, Boston University, Tufts University, and Charité – Universitätsmedizin Berlin, University of Zurich and Massachusetts Institute of Technology. The Harvard John A. Paulson School of Engineering and Applied Sciences (SEAS) serves as the connector and integrator of Harvard’s teaching and research efforts in engineering, applied sciences, and technology. Through collaboration with researchers from all parts of Harvard, other universities, and corporate and foundational partners, we bring discovery and innovation directly to bear on improving human life and society. For more information, visit http://seas.harvard.edu. Brigham and Women’s Hospital (BWH) is a 793-bed nonprofit teaching affiliate of Harvard Medical School and a founding member of Partners HealthCare. BWH has more than 4.2 million annual patient visits and nearly 46,000 inpatient stays, and is the largest birthing center in Massachusetts. The Brigham’s medical preeminence dates back to 1832, and today that rich history in clinical care is coupled with its national leadership in patient care, quality improvement and patient safety initiatives, and its dedication to research, innovation, community engagement, and educating and training the next generation of health care professionals. Through investigation and discovery conducted at its Brigham Research Institute (BRI), BWH is an international leader in basic, clinical and translational research on human diseases, more than 1,000 physician-investigators and renowned biomedical scientists and faculty supported by nearly $600 million in funding. To learn more, please visit BWH’s online newsroom.